For Cubs, Scouts and Explorer Scouts to try outdoor activities and experience the stunning local environment. Indoor accommodation and three meals a day in the dining room. For Scouts and Explorer Scouts there will be separate programmes and accommodation. 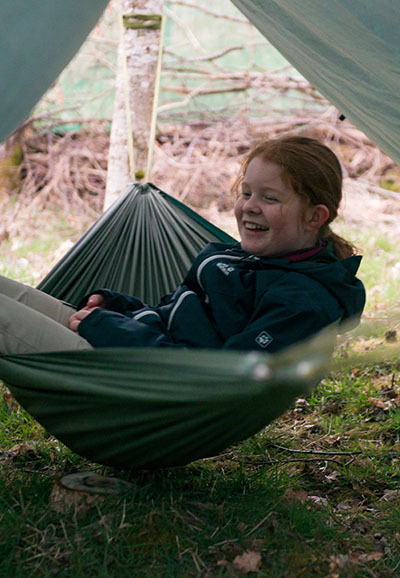 A true outdoors wilderness experience for Cubs - camping on Meggernie’s stunning camping fields, surrounded by Highlands scenery, with a programme that introduces the Cubs to some traditional Scouting and outdoors skills, with lots of time to explore nature. Tickets will be available to book soon. This year we're delighted to launch a new Camp at Scout Adventures Meggernie to help Cubs transition to Scouts. Our new Fast Forward camp on 4-6 October is for Cubs and Scouts aged between 9 and a half and 12 years old and focuses on developing Scout skills. We especially encourage Group applications to this camp, but single Sections are welcome to apply. The programme is aimed at activities to encourage Cubs and younger Scouts to develop the skills required for a Troop summer camp and the more adventurous nature of activities that Scouts participate in. Features of the programme include team building, Scout camp craft skills (patrol tent pitching, maintenance and striking; fire light and alter fire cooking, camp gadgets, patrol campsite layout, etc) in addition to the regular activities offered at Meggernie. Booking opens in February/March but to register interest and receive advance notice of booking, email fast.forward@scouts.scot. Cubs and Scouts aged between 9 and 12.